The My Docs Online Share option for Secure File delivery is available in the newest Web Client and in the Desktop App. All features are available in the Web Client, while selected features are available in the Desktop App. Administrative controls are in the Web Client (Group Administration… Group Settings… Share). You can select one or more files and use the “Share” feature to securely deliver with flexible options, control, and tracking. In the Web Client Sharing is accomplished one step at a time in dialogs at the top of the page, with the Secure File Delivery page your recipient(s) will see built “on the fly” and displayed as you select options, add comments, etc. In addition, a checkbox on each dialog lets you customize and streamline which options you are presented when Sharing files. For example, if you will never use a password, always use the “link” option, never need to modify expiration, those dialogs will be hidden in order to streamline the Sharing process. Want to make sure only your intended recipient can open the File Delivery page? You can include an optional password that you separately communicate to your recipient. For details and Group Admin options see “Put a Password on your Share Delivery”. If you include a Comment it displays on the File Delivery Page and in the email we send to your recipient (if you use the email option). For more details see “Add a Comment to a Share”. Select one of your Smart Labels to automatically choose the default Comment, Expiration, and Password (all optional). Smart Labels also make Share Management easier. Create your Smart Labels “on the fly” while Sharing files, or use Share Management ? Label Management to create, update or delete your Smart Labels. For more details see “Using Labels and Smart Labels when Sharing files”. You can set how many days your recipients have until the Share expires and the files are no longer available for download. Chose from 1 to 9999 days. For more details see “Set the number of days until a Share expires”. Select “Send File(s) using My Docs Online” to have us send an email to the addresses you select or provide, or select “Send File(s) myself with a link I can email”. For more details see “Share files via web link or email”. Share Management shows all your Shares, with rich details and complete control. Sort by Smart Label, Recipient email, Share Date or Share Expiration. 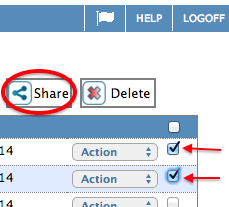 Use the Share Details page to Cancel, resend, extend or relabel the Share. For more details see “Cancel, resend, or extend expiration for a Share”. Track who is downloading which files, from where and when. For more details see “Use Share Management to control and track Shared Files”. You can create a Smart Label “on the fly” and you can create, update or delete Smart Labels using Label Management. Group Administrators can pick and choose what features their users see by setting default expiration, whether that expiration can be overridden by users, whether Smart Labels are allowed, and whether passwords are optional or required. For more details see “Group Administration controls for Secure File Sharing and Delivery”.